We placed a special project In Lane Cove, a district in Sydney’s Lower North Shore. Inside an old 30s style cottage in a quiet village surrounded by nature, TM Italia has placed a kitchen with island with blue lacquered bases, stone tops and oak columns. The restoring and extension project by the architects Patrizia Trento and Michele de Vido was developed on various stages: the dwelling’s closure contrasts indeed with the openness of the new building, whose full-height-windows allow a direct contact with the surrounding nature. An angular island composition and durmast columns were placed inside the main living space, with an amazing view on the park. 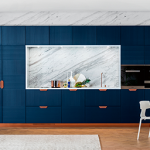 The island’s blue-lacquered base, with a soft touch effect, is realized according to the Miuccia model. 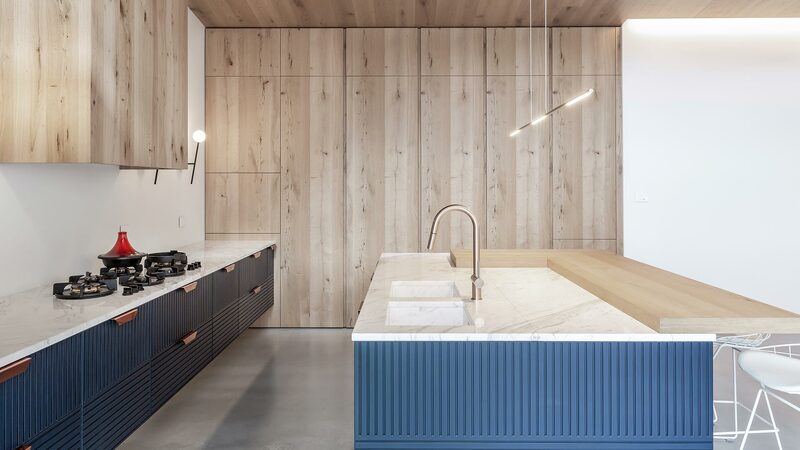 The island’s countertop is made of Volakas stone and incorporates an assembled double sink and stoves build in a suspended base. The three-dimensional decorated shutters show a velvet finish and combine a tactile pleasantness and a chromatic depth, creating elegant matches through the use of natural stone and the pink copper on the handles, for both the fittings and the base. 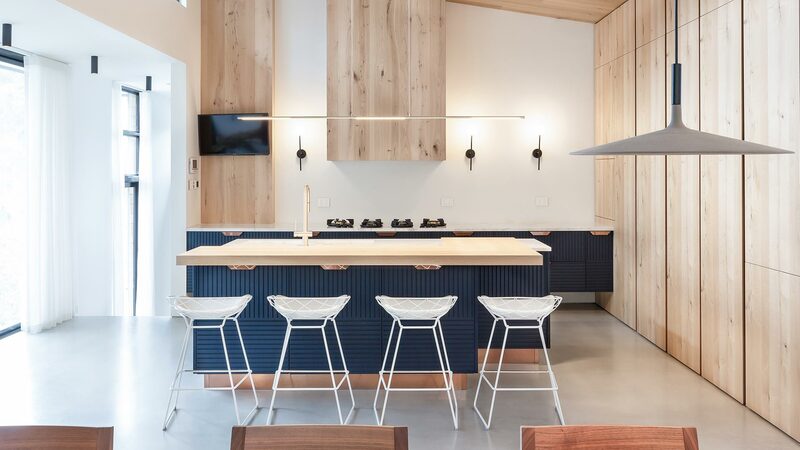 The island’s snack area is made of Rovere with slip knots. The same finish is made for the columns as well, on the wall’s full height, made according to the T45 concept. 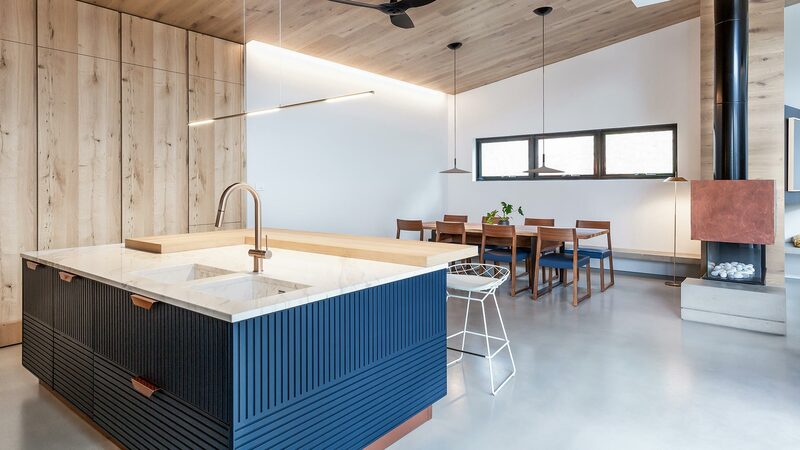 The choice of using the Rovere wood for the columns’ finish gives a style continuity to the island, together with further custom details and the outer landscape, where the whole architectonical project is placed. 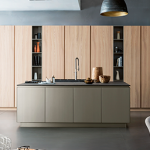 TM Italia’s authenticity of the materials, savoir faire and high handmade value is enhanced by this realization that includes custom elements such as the installed hood – designed according to the drawing – and the structure holding the TV, both realized in slip knot rovere. The whole project is based on values such as simplicity enhanced thanks to the focus on architectural and tailored details through which the italian suppliers created the decor by choosing among different materials and stylistic elements that could donate continuity with the surrounding environment. Design by: Interno61. Italian Design Studio.